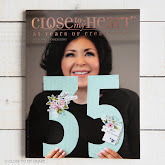 I cannot believe another year has gone by and another Idea Book is here!!!! 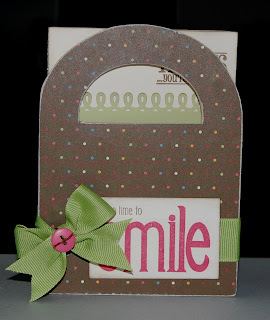 With each NEW Idea Book comes new SOTM's and that means we get to do some HOPPIN'!!! 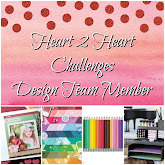 With over 60 Consultants this month, it should be FUN!! 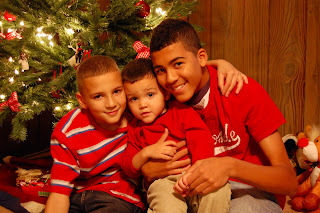 There's no better way to spend the first day of 2010!!! 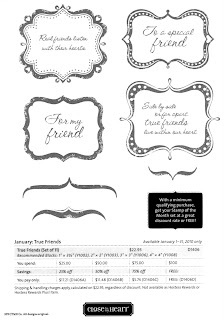 January's SOTM is True Friends and is available only through January 31st. 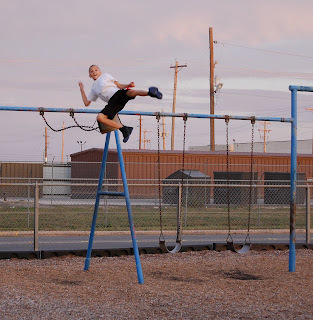 If this is your first "hop", don't worry, it's simple to do and SUPER FUN!!! 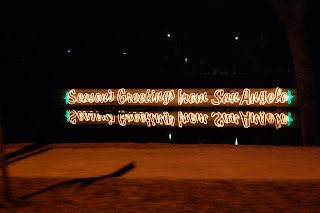 Just follow the links in each consulant's post 'till you come back around to where you started. 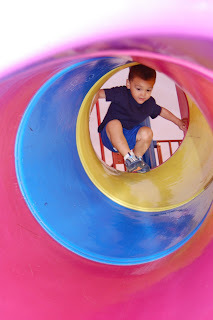 If you get lost along the way, you can go to Jena's blog where she has a complete list of participants....a perfect place to pick up where you left off. 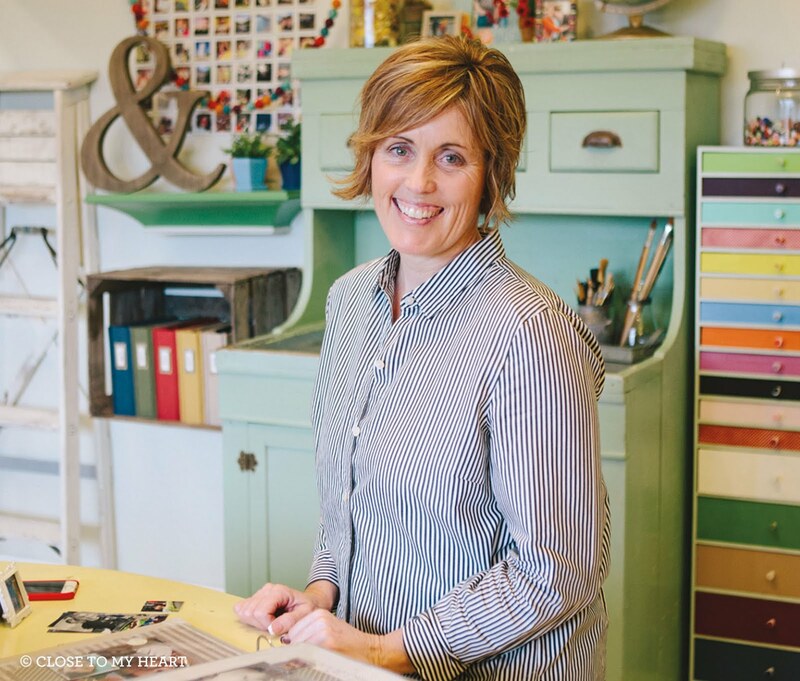 If you've come from TERRIE's blog, you're on the right track!!! 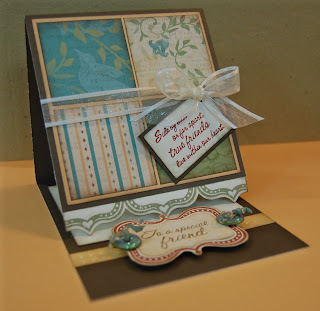 This month I decided to do a "easel card" which is a card, when opened, can be set on a desk or somewhere special to display. 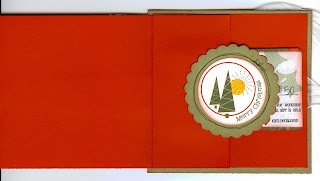 My card folded is 4.5" x 6" and will fit in a 5" x 7" envelope. 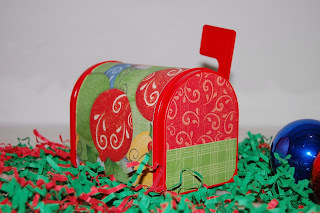 It has quite a bit of dimension so I would suggest hand delivering the card or paying the extra postage so they don't run it through the meter. 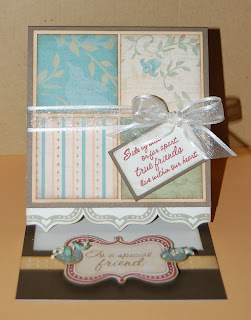 I used CTMH's NEW paper packet, Veranda....colors are Creme Brulee, Cocoa, Garden Green & Juniper. 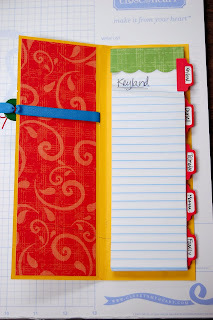 Now...most of you know that I'm not a girly-girl person but this paper is so PRETTY!!! 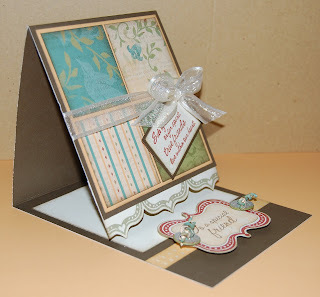 I can see tons of Spring layouts and cards being made using this pp. 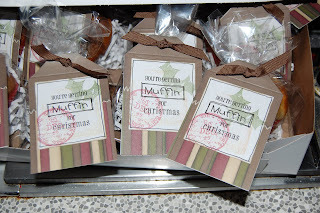 I also used Colonial White Ribbon Rounds (the satin edge 5/8" organdy ribbon....LOVE this stuff), Autumn Craft Buttons (the buttons are really Olive but they look good anyway), Prisma Glitter, Colonial White Waxy Flax, 3-D Foam Tape and I threw the color Barn Red in there for contrast. 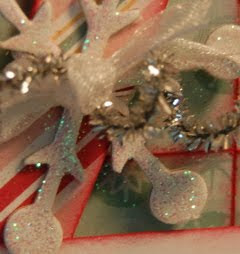 Close up of my buttons (Olive with Prisma Glitter, tied with Colonial White Waxy Flax with a tiny piece of B&T coiled to resemble curling ribbon.....In order for the card to stand up, you must put your focal element up on Foam Squares or put a button or something thick to keep the card from sliding down. 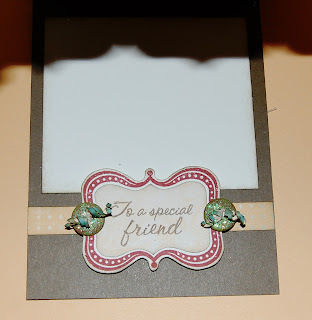 Here, I chose to stamp one of the frames on Colonial White Cardstock then stamped again on the backside of one of the B&T's, cut out the center and adhered to the cardstock. 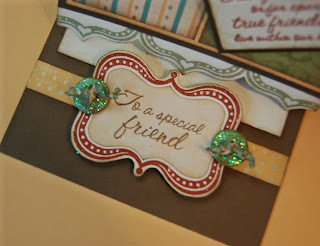 Next....hop on over to CHRIS's BLOG to see what she has to share!!! More Presents and ONE MORE DAY!!! ONE MORE DAY 'TILL THE HOP!!!! CHECK BACK TOMORROW FOR HOPPIN' GOODNESS!!! 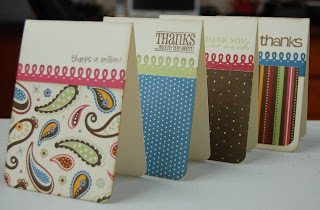 Make sure you scroll down to see my second post for today....."Notecards"
I made my sister and my cousin this set of 8 "thank you" cards using Magic Moments paper packet and Thank You stamp set. 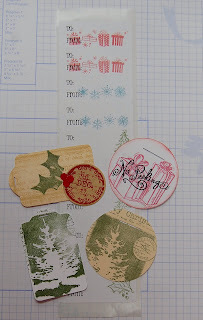 HINT: This stamp set also comes in Spanish and French (how COOL is that!!). I threw in some wide grosgrain ribbon that resembles the CTMH color Sweet Leaf...a Hollyhock button (from the retired Hollyhock My Accents) and some Chocolate Waxy Flax (it's the closest thing I had to Cocoa). I ink-distressed everything using Cocoa Ink and a sponge (LOVE these things 'cause I can cut each sponge into at least 5 wedges and get multiple uses out of them). 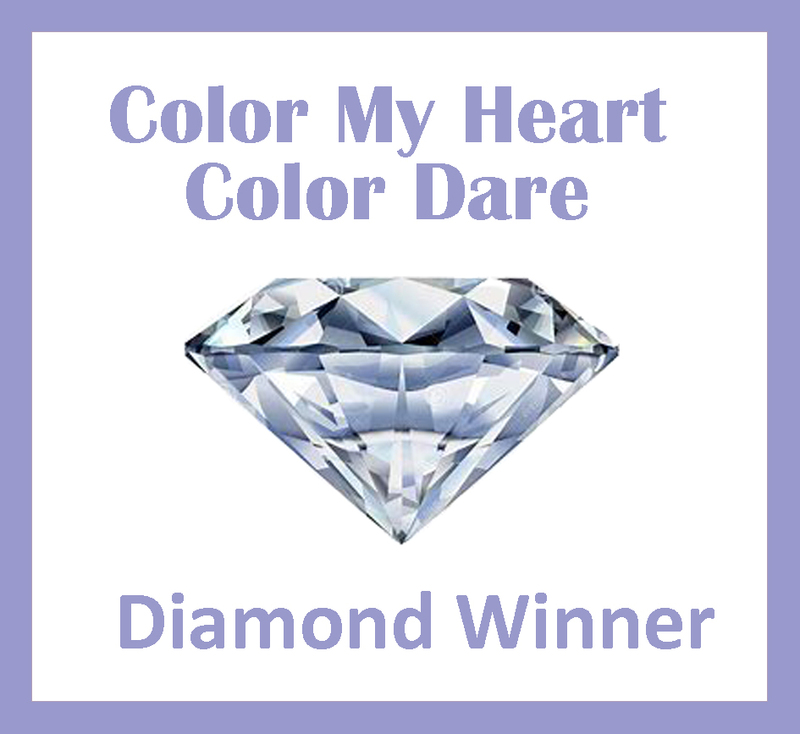 I used the September Word Puzzle (on the retired list so if you want it, you'd better get it before year-end)....Cocoa and Hollyhock Ink. 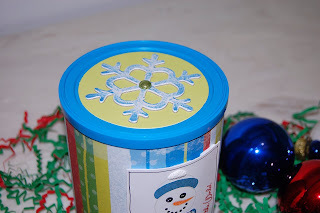 I also used the Martha Stewart Loop Punch (is was seasonal so I'm sure it's no longer available). 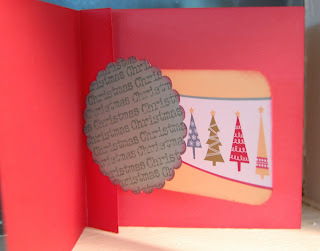 I rounded the corners of the bottom of the cards using the corner rounder. They're a little smaller than standard-size cards at 4"x5.5". I often choose this size for easy cutting of my B&T that I tend to hoard...lol. 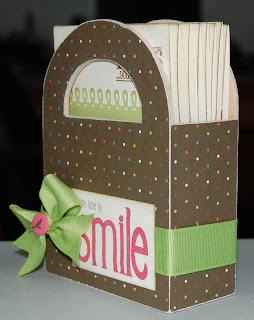 Here is a gift card holder that I gave to teachers. 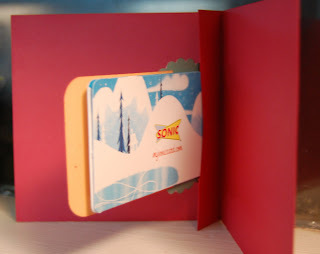 Inside was a Sonic Gift Card....teachers LOVED it!!! 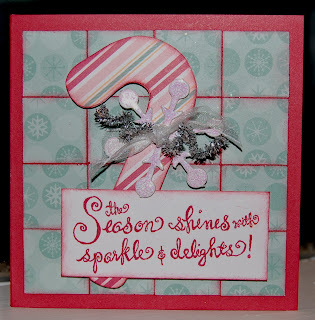 I used Jingle Creative Basics, freehanded a candycane shape, Dimensional Elements Flurry, Prisma Glitter, White Organdy Ribbon and a silver pipe cleaner, Holiday Warmth stamp set (October SOTM), Tulip ink and a sponge to distress all the edges. 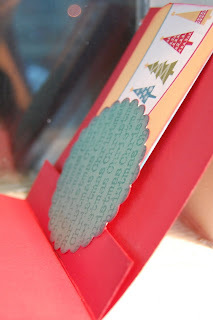 I added a flap to hide the sonic logo (cute but not what I really wanted the recipients to see at first glance)...I used Vintage Christmas stamp set to random stamp the "Christmas" all over the scallopped circle. 3 more days 'till the HOP!!! 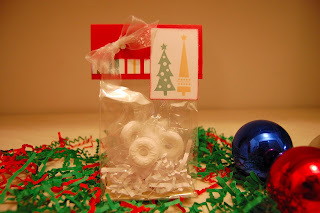 Over the next few days, not only will I be counting down to the January SOTM Blog Hop (full of NEW products from the NEW Spring 2010 Idea Book), but I will also be showing you my Christmas gifts that I gave you peeks of last week. 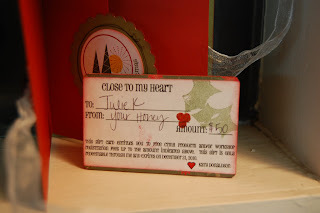 Here is what I did for 3 lucky customers who received CTMH gift cards from family and friends! Each one was a little different and was good toward the purchase of NEW product!! 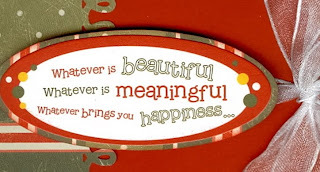 The card measures 4"x4" mounted on a 4.25"x4.25" piece of New England Ivy cardstock. 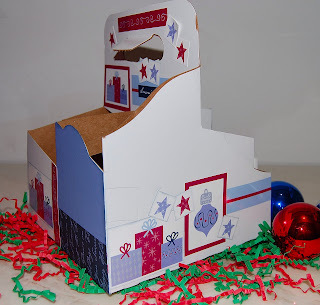 I used the retired Creative Basics Evensong paper packet and My Stickease from a retired Christams Card Kit. 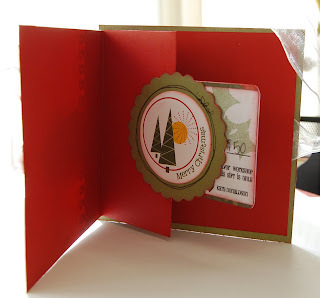 Just cut a slit in the accordian flap and slip the gift card in behind your focal point....it's pretty snug so it won't slide out. 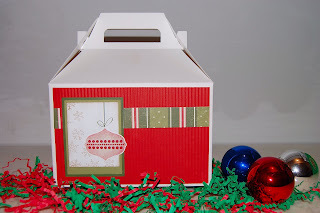 I saw this on a blog I visit regularly and thought it was the CUTEST gift to give my Friday girls (a group of girls that gets together every Friday for lunch). 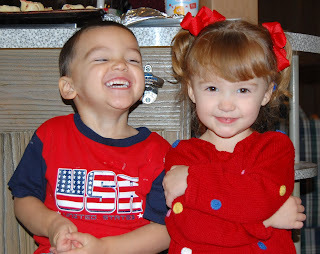 Since this Friday is Christmas, we ate lunch today....they LOVED them!!! Isn't this FUN!!! I just "peeks" into something wonderful that someone has been creating. I hope you all are enjoying this as much as I am! is written down in this handy little notepad!!! 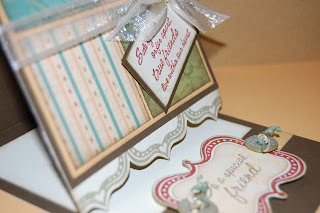 I haven't personalized it yet....thinking of stamping WISH really big....maybe using one of our E-Size alphabets. 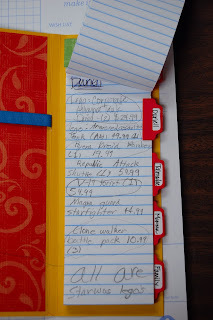 As you can see, my 9-yr old has his list FULL!!!! 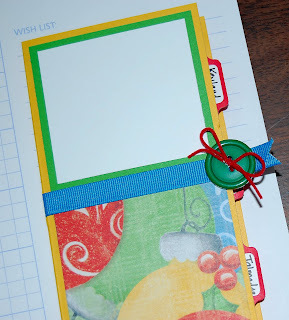 I also used the "tab" QuicKuts die (cut using my Cuttlebug :0) for the tabs. 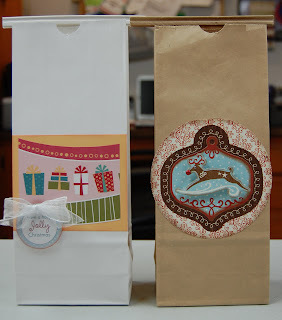 This weekend was my annual Tags, Bags & Boxes Workshop. The girls seemed to enjoy themselves and they made lots of goodies!!! Tags....self-stick, ran through my printer using Pharmacy font (http://www.dafont.com/) and stamped using various stamps....they also made tags cut using my Cricut and Vanilla Creme & White Daisy cardstock. 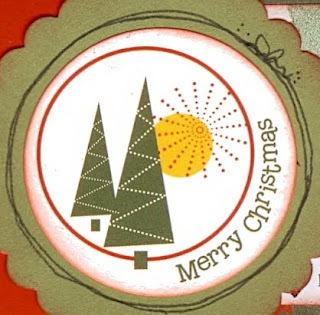 We used Vintage Christmas stamp set (one of my FAVES!!!). 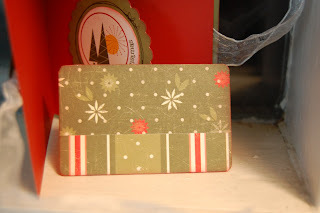 The base of the large one measures 8"x5" and its top is approximately another 3.5"....Cranberry, New England Ivy, Olive and White Cardstock and Evensong Creative Basics paper packet (retired). 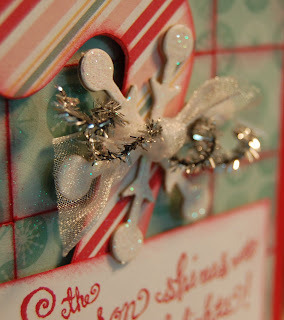 I used Holiday Trinkets stamp set as well as Feathery Flakes stamped using second generation stamping. Cranberry, Desert Sand and New England Ivy Inks. 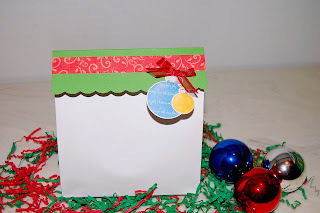 The base of the medium tote is 6"x4" and the top is approximately another 2.5"....I used the Jingle paper pack, No Peeking stamp set (retired) and Tulip Ink. 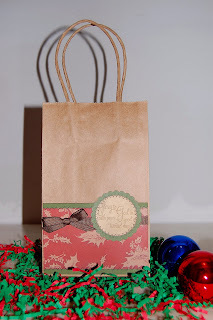 Bag-a-lope (a bag made from an envelope) made up of a 5"x7" envelope....finished size measures about 4"x7"....random stamped using Holiday Jingle stamp set and Holiday Red Ink, Olive Ink, Chocolate Ink, Creme Brulee Ink and Twilight Ink. The ribbon is from a LSS (LOVE, LOVE, LOVE wide ribbon). 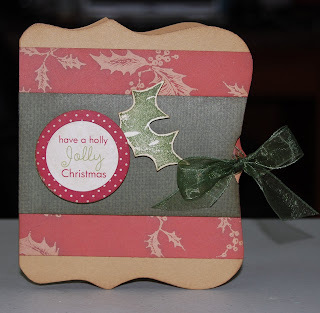 I scalloped the top (from picture you can't see) using the corner rounder. Bag-a-lope using a large envelope (approximately 9"x11").....finished size measures 6.5"x7" but we cut off the top 3". 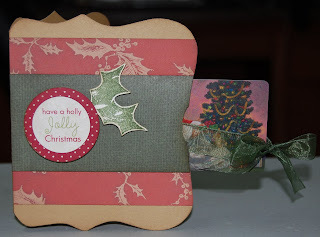 I used Hollydays paper packet (retired) and Hollydays Stickease (retired). The ribbon is from Wal-Mart. I used the corner rounder to make the scallops. 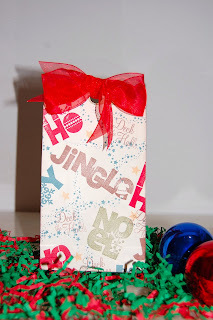 We used baby powder to take the "sticky" off the back of the Stickease so they could stuff it with their present and then close it with Tombow....the weight of the Stickease actually keeps it closed pretty well. 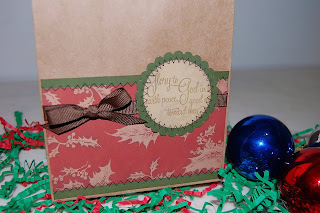 Craft Bag using Traditional Holiday paper packet (one of my all-time FAVORITES, it's retired and I'm running out...boohooo!! 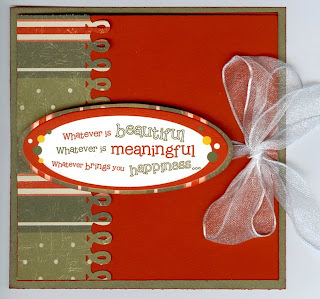 ), Card Chatter - Christmas stamp set, Cocoa Grosgrain Ribbon, My Legacy Writers to stitch and Desert Sand Ink. 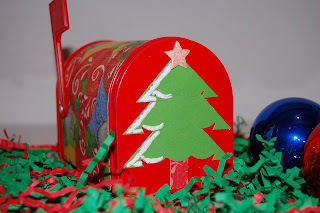 Mailbox using Hollydays paper packet (retired), Liquid Applique, Craft Heater, Corner Rounder & Star dimensional element from Flurry. I got the mailboxes a while back from Target's $ Spot. 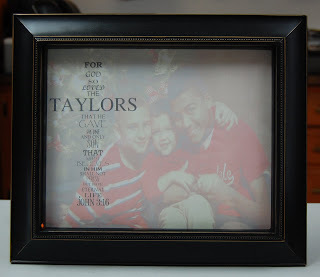 We left the front panel blank so they could personalize it with an initial once they decide who's the lucky recipient! 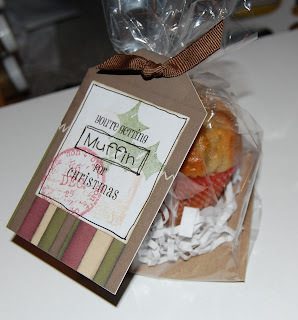 Clear Bag....using Jingle paper packet, Holiday Trinkets stamp set, Creme Brulee & Tulip Ink, White Organdy Ribbon. 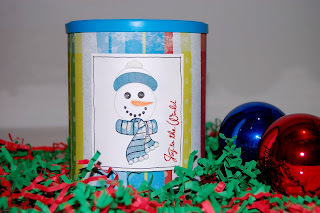 Snowman Can....using Deck the Halls paper packet (retired), Flurry Dimensional Elements, Twinkle Brads, Liquid Applique, All Decked Out stamp set, Christmas Scripts stamp set (retired), Black, Cranberry and Grey Wool Ink. I colored his carott nose using Watercolor Pencils (soft orange). The can is an old Similac can from when my 2-yr old was a baby. 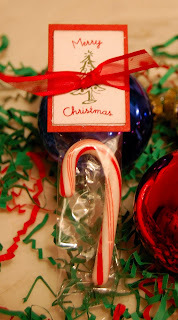 Candy Cane topper....I used Festivities stamp set, Cranberry and New England Ivy Ink. 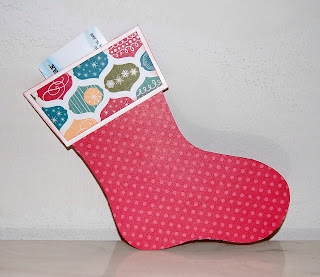 Stocking Gift Card Holder....I used Jingle paper packet and traced a stocking I bought at HL. 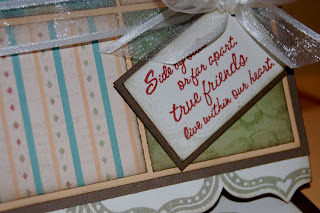 I also used Tulip ink to edge distress the pieces. 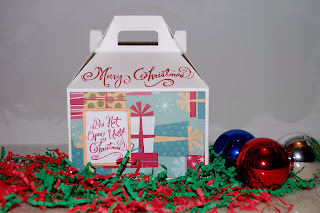 4-Pocket Box....I used drink holders from Chick-fil-A and one of CTMH's card kits, Whimsical Holiday (retired). 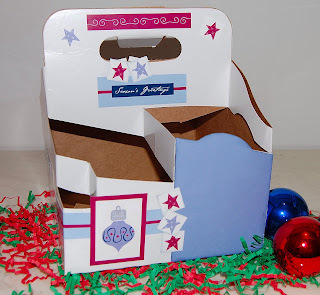 We just put stickease around the box to hide any logos and traced the front panel onto the card bases and cut out.